When you're short on sketch time, make a grid! Watercolor, Pitt Brush Pens, Fountain Pens, or whatever else I had next to me at the time! You can click this image to enlarge it. 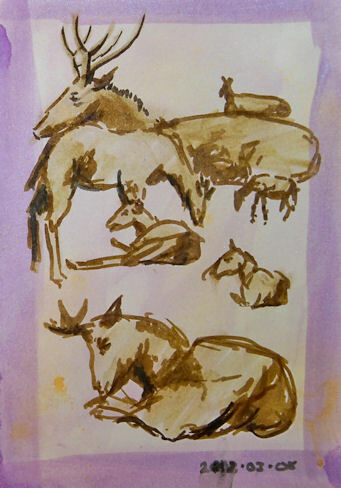 I feel it's very important to continue sketching, and not give that up when the going gets tough. 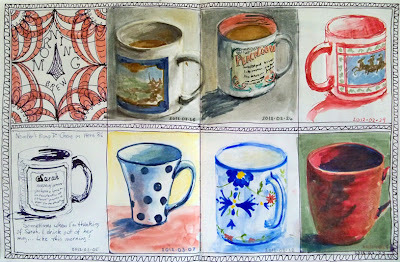 One of the things I do when time gets tight is I make a grid and sketch a series over time. I have several grids going at any given time on different themes. I try to select themes that hone specific skills. This one was started a few weeks ago as a means of practicing elipses and symmetry. 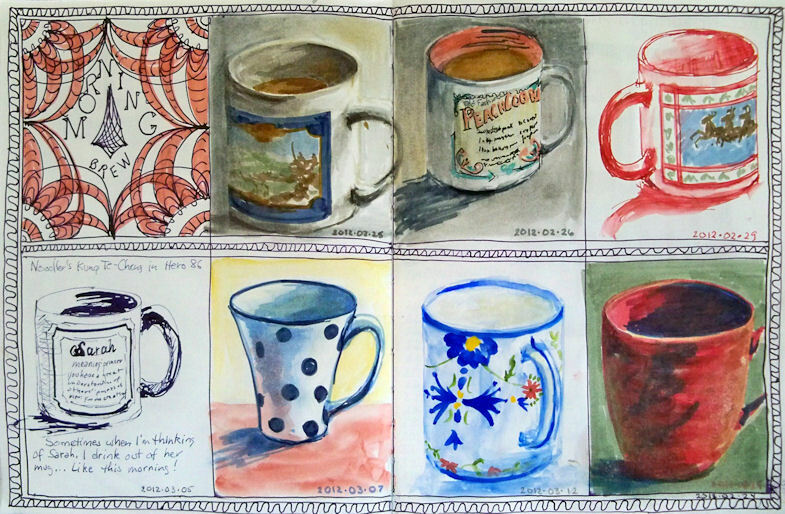 Whenever I had a morning without having to immediately dash off somewhere, I sketched my coffee mug. I sketched the last mug this morning. These were all done directly in ink, so warts and all, I had to live with whatever came out of the pens. I'm really enjoying this larger sketchbook, and it certainly presents great opportunities for gridded series! I have a few portrait grids going (32 portrait boxes across a two page spread!) and some other subjects too. Way fun. Great practice. Quick to do. No excuses! I made some cards to send letters to my Mom, who is over 1,000 miles away from me. I cut about a half dozen cards from Aquarius II paper, and toned a few of them with some diluted acrylic traditional and iridescent paints. The surfaces have just a bit of shimmer to them. After I took this photo, I signed the image and put a border around the sketch. I forgot to take another photo of it when it was finished, and now it's already been sent off to her. These flowers were from a family birthday party that my husband and I attended, so it was a perfect addition to the letter telling her about the event. It does take a lot of time to make cards for people, but what a nice way to be able to share our sketches! 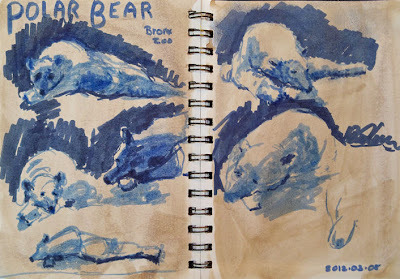 Our sketch group was back at the Bronx Zoo on Thursday. It was a spectacularly warm day, so we spent much of the time finally being able to sketch comfortably outdoors. We weren't the only ones with the idea to visit the zoo on that beautiful day; that was the most crowded I've seen it all winter! We started out with the Polar Bear. I'd been wanting to sketch him for so long, and this seemed my best opportunity, since he was outside. He was engaged in his morning rest, but did keep moving and looking around --- not nearly as still as our figure models in life drawing! 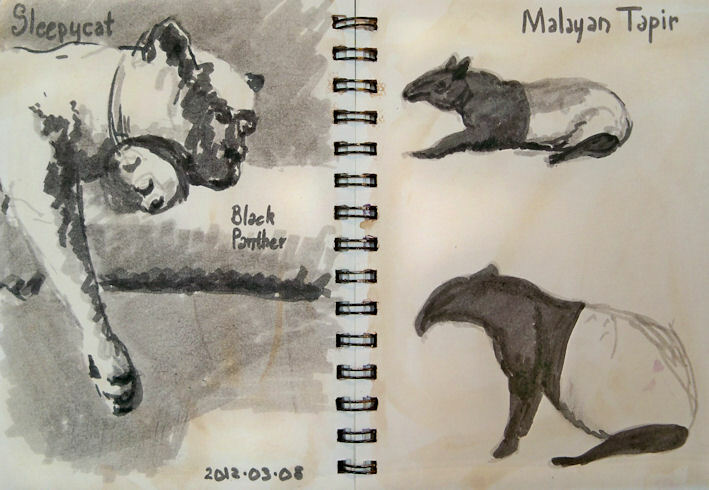 One thing about drawing animals is that you realize that even though you thought the poses in life drawing were way too short, at least the models don't move much once they assume their pose! I went past the Polar Bear again later in the day on my way back to the car. He was swimming in his deep pool, diving, splashing, and playing with pool toys! Who knew that Polar Bears would play like that? He'd throw them up in the air and chase them under the water. It was very entertaining to watch. From there we went over to Jungle World to see what was there. Even though we've gone several times this winter, we never went there. Well, that is the greatest place to sketch!!! The gorgeous black panther was lying on a thick log in his exhibit, which gave me a chance to examine that huge paw that he left stretched downward over the limb. The Malayan Tapir was in the exhibit just across from him, and I'd never seen one of those before. They have fabulous shapes to sketch. There was so much in this exhibit to draw, but since it was indoors, I felt it would be best to save it for cold or rainy weather, and I ventured back outside. The deer in this herd didn't stay still for long. Even the ones lying down shifted position frequently, plus they were far away and hard to see well. 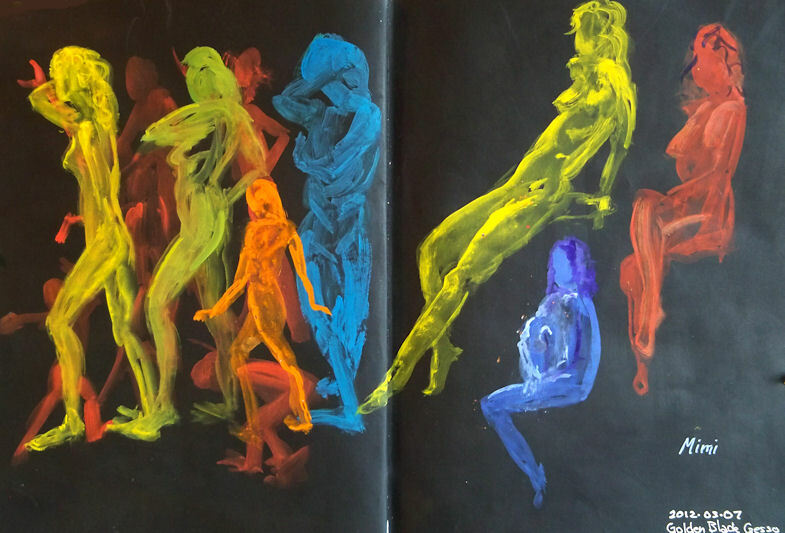 I tried to capture some gestures though, and study the way they move and are put together.. I'd brought binoculars with me, but found that they are really impractical. By the time you look through them, find your subject and focus, the subject has moved on. 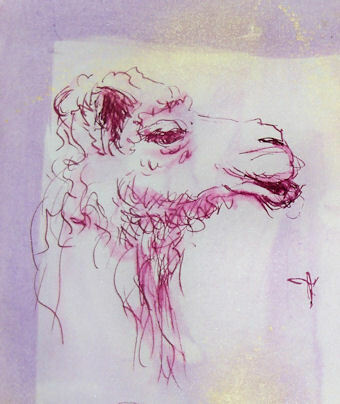 I love sketching camels. Like giraffes, I find they have fascinating, expressive faces. 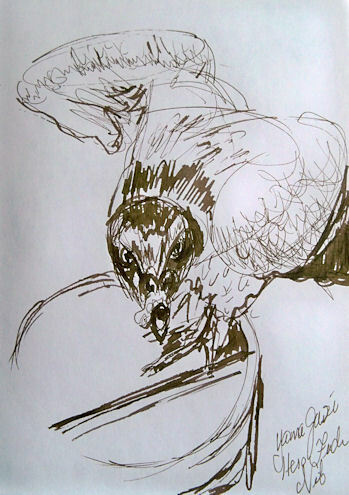 I did a quick portrait sketch of this one, and was about to start another when we were asked by the zoo staff to move. They were trying to move one of the camels from the enclosure into a building, and didn't want anybody to become a victim of a recalcitrant camel, so I only have this one to show. All in all, it was another great day at the zoo! When I get home, I look at my photos and always wish I'd taken more. I get so absorbed in my sketches that I forget to take photos. In a session of short poses in life drawing, I find there is not enough time to draw and paint each pose. Some open studios have longer poses, but in our sessions, the longest pose is 20 minutes. If I plan to paint, my only option is to start throwing paint from the moment the model takes the pose, and hope for the best! There is no time to draw first, or correct, or fiddle much. I like doing them in montage formats like this, but every once in awhile I pull out a single sheet of nice paper and do a separate painting, like I did for the one at this link. These poses were just 30 seconds to a few minutes each in an open studio life drawing session with a fabulous model. Since the poses are so short, I usually do them in some sort of a montage format. I had this page spread prepared in advance using Golden Black Gesso, and since I happened to have gouache and watercolor with me yesterday (thanks to my new palette setup), I thought it would be fun to play with different gouache colors on the black background. I loved the way it turned out, and my only regret was that I hadn't prepared more pages this way. I think I'm going to prepare some black supports with "glittery stuff" like I used for some of my aquarium sketches, and bring them to life drawing next week. Way fun! I'd been hearing about these "fude nib" fountain pens for quite some time. The nib is bent upward so that by writing with it at different angles, you can vary the width of the line. I tried to get photos, but my camera just isn't good enough to capture the details on the nib. In searching online for a link so that you could see some images, I came across this review of the same pen, which has excellent photos to accompany it, so you can check it out there. A friend tipped me off to a seller who had them on Ebay for $5, so I figured for that price I couldn't go wrong. (That seller is now sold out, but they are available through http://isellpens.com .) I did my usual soapy water -- clean water flush and dry, and inked it up the next evening with Iroshizuku Yama-Guri ink, which is a nicely-flowing ink in the brown family. Using the end of the nib, I was able to get an extremely fine, yet still wet line. 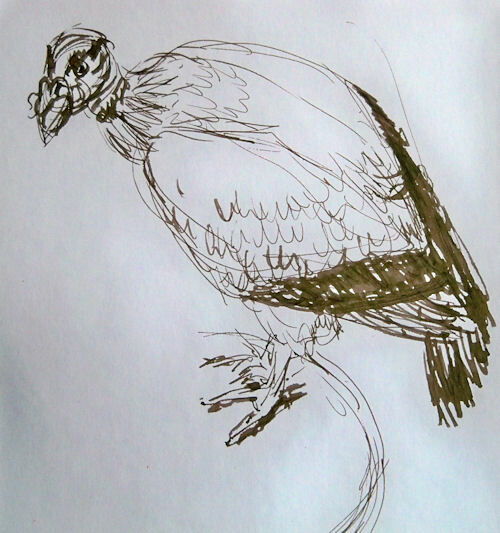 It was a great pen/ink combination for quick, thin-lined wirey gesture sketches of this vulture. 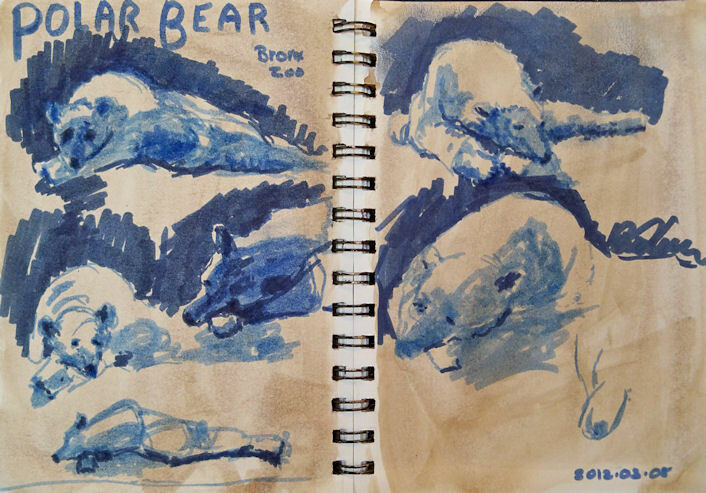 I did them from photos I'd taken that day at the Bronx Zoo, since I didn't have enough time to sketch them on location. 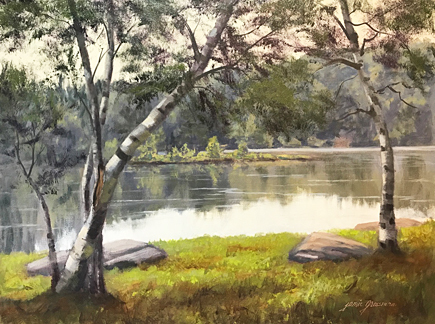 In addition to that wonderful fast, juicy, thin line, I was able to then lay the broader area of the tip down to get in my dark shaded areas and accents. In fact, I loved the pen so much that I buzzed through five pages of sketches and then went right to my computer to order the only three that the Ebay seller had left. The pen is rather heavy, and you may or may not like that "rocket ship" look! It does come with a converter, so it's very easy to fill. I've also been told that the nib for this pen will fit on a standard Noodler's Flex Pen or a TWSBI! Although I do have both of those, I haven't yet tried it. So if you don't like the pen body, there are other options, and it might be worth it for the nib. If you like to sketch with fountain pens, this is definitely one that you'll want to check out. Sailor also makes these types of fude nib fountain pens at reasonable prices. I've been playing with a couple of the Sailors over the past day or so too. I'm certainly becoming a fan of this type of nib. Watercolor and Gouache are cohabitating in my palette! I bought this palette online from Wet Paint Art Supply in Minnesota. Apparently they are only made by special order, so Wet Paint ordered a bunch. Their customers liked them so much that they sold out almost immediately and ordered a lot more! The palette only comes with 12 colors (in two rows of six), with room for a third row of your own half pans and colors, for a total of 18. So, how did I transform this into something that will hold 32 half pans and one whole pan? There is a metal plate with holders for the pans. It weighs a ton. I took that out. I fiddled with half pans in the empty space to see how many I could fit, and what the best configuration would be. I discovered that four rows of seven colors each would fit with the pans placed vertically, but that I could squeeze in a fifth row if I had the pans run horizontally. In that last row, because of the curves on the corners of the palette, only five would fit. But I could fit a whole pan vertically in place of one of the half pans --- there was enough space to accommodate that. I am always needing extra white gouache when I'm painting with gouache, so I decided I'd keep my white in that one. I took out a roll of adhesive magnetic strip. It comes rolled up like a roll of tape. I bought mine a long time ago and I don't remember what brand it was, but it looks something like this. I bought it in a craft store. I cut five strips that fit across the width of the palette. Since they were curled from being in the roll, I heated them with a hair dryer, which softened them a bit, and pressed them under a few very heavy coffee table books overnight. The next day, they were flat. With the adhesive side up (bare magnetic side down), I placed them in the palette, approximating where they would go. I'd already decided which colors would go where the night before. I filled the pans that weren't already loaded, and wrote the names of the colors on each pan with a black fine point Sharpie. Starting with the top row, I peeled the paper strip off the magnet, revealing the adhesive, and stuck each pan down onto the adhesive strip, working across the row. I put in three rows of watercolor pigments (21 colors), then the 12 pans of gouache. 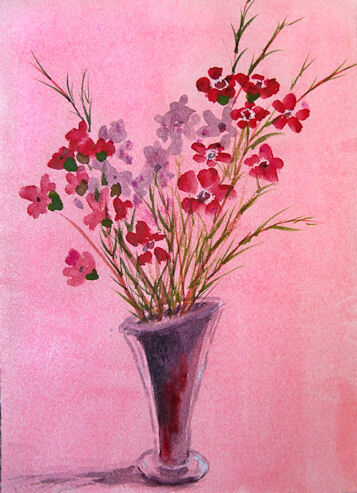 One thing about working watercolor and gouache together is that the opacity of the gouache, plus the chalkiness of white paint, can get into your transparent watercolor and destroy all that beautiful luminosity. This is why I always kept them in separate palettes. Since this metal palette has two sides, it keeps them separated easily. I'm used to having just two mixing areas for watercolor --- one for warm colors and one for cool. So the two sides of the top mixing area provide the wells I need. However, for gouache I need more areas, since I have to be able to mix value as well as color. All those little wells in the lower area are perfect for my gouache! 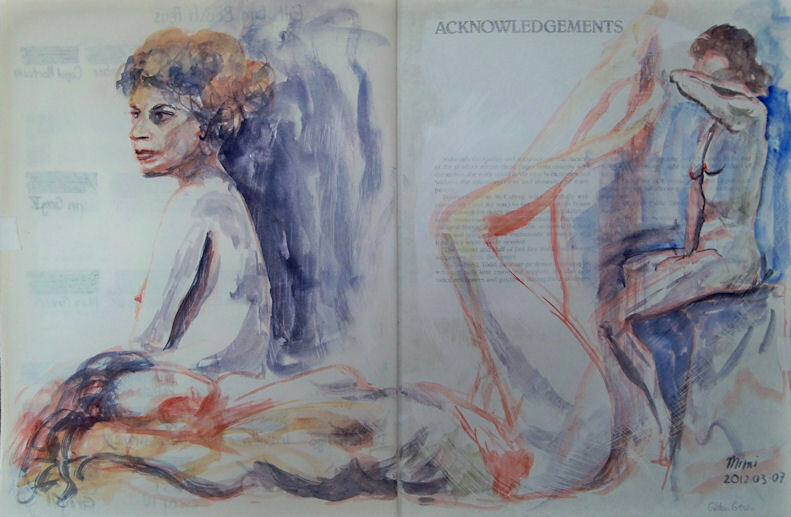 I was also able to eliminate the opaque watercolors from my palette. 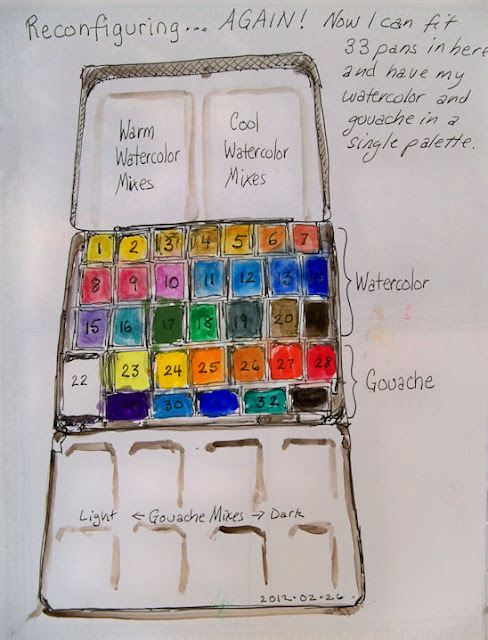 Usually I have cadmium red, a couple of cadmium yellows, cadmium orange, chromium oxide green, and a couple of other opaque watercolors in my watercolor palette. Now I can just substitute gouache when I need those, and keep all my watercolors transparent. That gives me an even larger color range than I had before. I made the chart above so that I could keep track of what colors were in which pans, until I get to know my own system better. I also knew that initially, I'd be making some changes; that's why I numbered the pans on my sketch, instead of writing in color names. When I change a color, I can just change the name on the numbered list of pigments. I've already swapped out a few and shifted some around. I've been looking for a way to do this for several years, but never found quite the right thing. This works for me at last!